The share of Russia took many hardships, her story is truly dramatic. Over the past hundred years Russia had to go through a whole series of regional conflicts, the two world wars, the Cold War. As a result of these events and their consequences the world has witnessed the collapse of two well-established form of government in our country, the enormous geopolitical and economic change. Were losing territory and reunion, retreat on the political front and the stunning victory in the global political arena, the financial and economic crises and periods of incredible growth. Today, any responsible citizen of Russia questions arise: What is modern Russia acquired by the many reforms? As far as modern Russian efficient compared with Russia since the Soviet Union? What is the future of the new Russia? To answer these questions, we conducted a comparative analysis of the most important indicators of the development of Russia during the two periods of its history — as the Federal Republic (RSFSR) in the Soviet Union during the recovery after the Great Patriotic War from 1945 to 1960, and becoming independent of the Russian Federation (Russian Federation ) after the collapse of the Soviet Union from 1995 to 2010. For the study was taken in 1995, not 1991, to give a little head start of a new Russia, because the results of the Second World War and the Cold War were different. In 1945, there were no destructive forces, the Soviet Union expanded its borders and influence in the world, which contributed to the early commencement of economic growth. After the fall of the Union began to operate the inertial forces, which lasted until 1998. On the other hand, it would be unfair to give too much of a head start before the Russian RSFSR, as the government had a chance to turn the tide and take advantage of a market economy in the middle of the last decade. To understand that Russia has acquired from 1945 to 1960 and from 1995 to 2010, you need to first understand what she lost. During the war years (1941-1945 gg.) In the USSR killed nearly 27 million people (RSFSR lost about 14 million), millions are disabled. In 1710 the Russian Federation cities and large towns were destroyed, some of them hardly had the surviving buildings. Burned about 71 thousand villages and hamlets. Were destroyed 30,000 industrial enterprises, tens of thousands of bridges and ferries, hundreds of thousands of railways and highways. During the war, the entire economy has been aligned to the military. As a result of the loss of population and enterprises of all kinds of infrastructure GDP territories liberated from occupation, fell more than 30% [1,2] (Figure 1). But thanks to the incredible courage of each soldier-liberator and rear GDP per worker across the country has decreased compared with 1940, an average of 14% [3,4,5]. With the collapse of the Soviet Union losses were no less impressive, but something much more serious. The population of Russia in this period of change unlike other indexes slightly — only 4.4% , but the comparison in terms of GDP at PPP gives a depressing picture. In 1991, GDP at PPP in the USSR exceeded 1.9 billion U.S. dollars (at the time of the collapse of the Soviet Union had a GDP equal to 3.1 billion, and a few years before — 3.5 billion). In 1995, GDP at PPP in Russia amounted to just 1.25 billion, ie loss of 34.2% . It turns out that after the war, the Russian Federation had a much more stable position in the economic, geopolitical and military terms, without regard to demographics. This is not surprising, because the Soviet Union ended the war victory, and the Russian Federation is clearly lost on the dissolution of the Union. Average GDP growth in the USSR from 1945 to 1950 amounted to 9.11% (the national average of about 14.7%). This high growth was ensured, despite the many difficulties and hunger due to the sharp initial positive momentum after the victory, millions of free labor of prisoners of war and inmates "dividends" from the Great Victory and all its derivatives. Across the country, the increase was even higher, because the in the first place was an active recovery and liberated most devastated areas. The average GDP growth rate of the Russian Federation from 1995 to 2000 is 1.81% . This is due to the continuation of the inertia of economic recession, the crisis of 1998, and perhaps most important — the government's failure to reverse the situation. 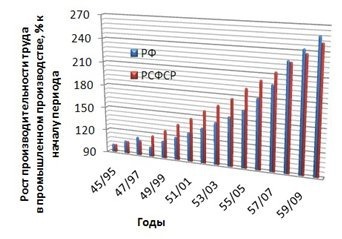 The period from 1951 to 1960 shows an average increase at 5.81%, from 2001 to 2010 — 5.07% (including the consensus forecast for GDP growth in Russia in 2010 about 5%). In this case, the 2009 GDP fell by 7.9% due to the strong impact of the global financial crisis on the unsteady economy, the withdrawal of foreign capital (including because of the war in August 2008), the decline in business activity and business confidence indicators fall community the entire population of Russia. It should take into account that due to the sharp decline in consumption and business activities, many items are no longer sold, there was a huge crowd at their stores. After the restoration of confidence it will all be sold out instantly, and you can expect a speedy recovery. We map the graph (Figure 2) GDP growth for the periods to the beginning of the period, ie for the RSFSR in 1945, and for the Russian Federation by 1995. 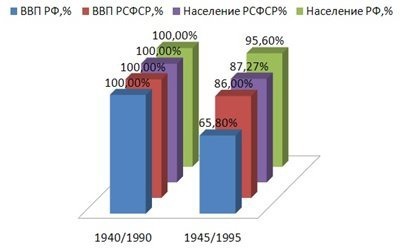 By the end of 1960 compared with 1945 GDP in the Russian Federation increased by 271% (the GDP of the USSR according to various sources on the average about 450%) . 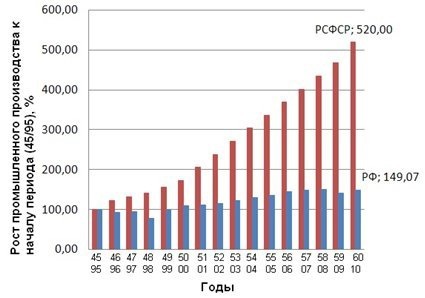 Russia's GDP growth from 1995 to the end of 2010 is estimated at 175.5% . However, it is important to understand that the quantitative measurement of GDP is based on the assumption that the product quality and competitiveness are the same parameters. In the real economy, it is not. To commensurate the real strength of the economic development of the state, it is necessary commensurate increase in GDP per capita (Figure 3). The results of the comparative analysis were unexpected: the Russian Federation and the Russian Federation have developed for this indicator in a similar way. Moreover, the growth rate in the last ten years has been higher than in the days of the Russian Federation: the annual growth has averaged 5.21%, while from 1950 to 1960, the figure was 4.35%. In 2010, GDP per capita will rise by the end of the year by more than 5%. However, although the growth rate of GDP per capita was about the same, while the growth of the GDP from 1945 to 1960 was higher, the modern Russian citizen is still more than two times richer than in 1960. The data presented in Fig. 4 clearly show the ratio of the size of the economy and the GDP per capita in 1960 and in 2010 when converted to U.S. dollars in 2009. But there is another advantage to Soviet times. Apart from the fact that modern Russians higher purchasing power in Russia today, there is no shortage of goods, and certainly there is no shortage of food. And this is a very significant plus. In this article, we will look into all the reasons for shortages in the USSR and abundance in the Russian Federation. In short, the case is a colossal difference in the size of the economy. 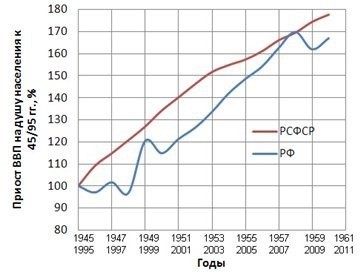 Despite years of economic chaos of the 1990s, Russia's GDP in 2010, significantly higher than GDP in 1960 (Figure 4 a)). In other words, to feed the Russian Federation in 1960, it was required to allocate about 4% of GDP on solving the food problems, and in 2010 these same needs requires no more than 1.6%. 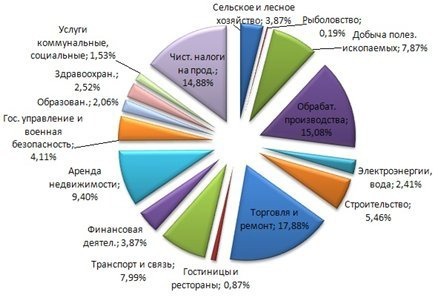 A higher volume of food sector in Russia explains the abundance of food. A similar situation is with other products and services that are lacking in the Soviet times. In fact, she's economic structure, which has a modern Russia, was founded in the 50s of the last century. It was in the late 1950s the Soviet Union began to create a framework for resource-based economy, and in 1960 one of the main task was to establish itself as an energy superpower status. However, Western countries strongly opposed to this and the process dragged on for decades. This task is successfully completed modern Russia. In comparing the structure of the economies in 1960 and 2010 (Fig. 5) do not forget that the sizes of the economies have changed significantly. In 2010, the GDP approximates the scope to 1990, but it surpasses the GDP in 1960 in absolute terms. Thus, in 1960, mining accounted for 5.1% of GDP in 2010, the industry has been 7.87%. Oil production increased by 238.3%, and gas production from 7458.5%. Also, do not forget that the oil and gas industry is not only of production and generally takes around 25% of GDP in 2010. The volume of exports as a whole in 2010, higher than exports in 1960 slightly more than 5 times. The volume of oil exports (excluding oil and natural gas) in 2010 more than in 1960 by 7.5 times (Fig. 6). Thus, there is a dependence of modern Russia from the export of raw materials. Course taken by the government to modernize the Russian economy still conceived a minimal effect. Talk about any significant developments began upgrading can be no earlier than 2015, while the modernization itself will clearly manifest itself only in 2020, by which time dozens of times will have to grow up now unacceptably low volume electronics manufacturing. Raise some hopes civilian and military shipbuilding, and in particular, aircraft. There must be a qualitative leap in the production of space technology. Predict the domestic automotive thankless task, but you can expect the growth of production in the Russian Federation foreign brands. Probably the emergence of Moscow as an international financial center. But this is all just predictions and hopes. Let's see how these things were in the period 1945-1960 gg and 1995-2010 years. The development of industry, especially heavy industry, the Soviet Union was a key focus. It is not surprising that by 1948 the volume of industrial production surpassed pre-war levels. USSR applied a tremendous effort and achieved incredible results: were built more than 14.2 thousand large companies, the volume of chemical and petrochemical industries have grown in 1945-1960. more than 660%, oil production has increased by 650%, gas — 1,250%, coal — by 235%. Volumes of production of mechanical engineering and metal working — almost 600%. Smelting of iron and steel increased by 430%, from 12.3 million and 8.8 million to 65.3 million and 46.8 million, respectively. The share of heavy industry in the Soviet economy was growing steadily. For example, in 1945 it amounted to 60.0%, and the light — 40%, in 1950 — already 68.8% vs. 31.2%, for 1960 — 72.5% versus 27.5%. Labour productivity through mechanization and automation in the early stages of industrial production increased from 1945 to 1950 by 50%, and from 1945 to 1960. — 200%. The results of such impressive results in comparison with the results of modern Russia are presented below. Of course, in this era of industry is growing less impressive pace, but to compare the growth of industry in percentage terms is not entirely correct. 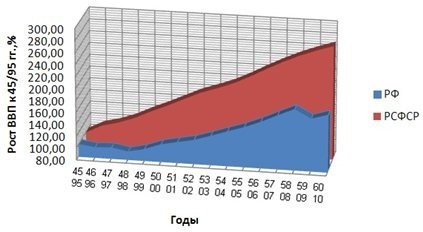 First, although the end of industrialization in the ground and called in 1940, the ratio of the volume of industrial production in other sectors of the economy of the RSFSR came only in 1960. The dynamics of growth of the share of industry in GDP is shown in Fig. 8. Rate of change of industrial development — is the ratio of GDP growth to an increase in the volume of the industry. This ratio shows the dynamics of the growth of other sectors of the economy relative to the industry. In 1960, the share of manufacturing in GDP was at about 55%, and subsequently, the figure was 60-70%, while in the modern economy, this figure does not exceed 40% (in 2009 it was 37%). However, the share of industry in relation to other sectors is not an indicator of the level of life of citizens and the competitiveness of the state. In general, the value of 37%, higher than in most Western countries, but the standard of living of the population and per capita GDP of Russia is still behind from those in its Euro-Atlantic competitors. In 1945, Russia has significantly lagged behind the number of cars, civilian aircraft, etc. It is not surprising that the increase in their number was exponential until 1960. Not to mention the rocket and space technology, which, by and large, did not exist before 1950.
commercially oriented economy of the RSFSR constantly required a high level of development of the "A". This distribution does not mean that the production of the means of production is the net investment in the future of the country, ie the future of the exponential growth of the number of products. Otherwise, the Soviet Union had overtaken the production of all countries of the world, including the United States by 1980. That did not happen. In the Soviet Union, has been maintained shortage of consumer goods. 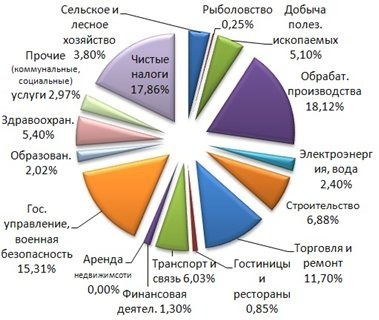 In modern Russia the production of consumer goods fell to indecently low — 1.35% (against 8.50% in 1960), light industry goods imported in large quantities. We will not compare the volume of output of military equipment. USSR militarized state, which not only sets the task to catch up with and surpass the United States, but is always ready for a new world war. As for the production of civil engineering (aircraft and aviation equipment, ships, buses, trucks, cars, tractors and other agricultural machinery, refrigerators and other household appliances), the rate of growth here was lower than the growth rate of the industry as a whole. The growth of the individual units of production in different periods was different. 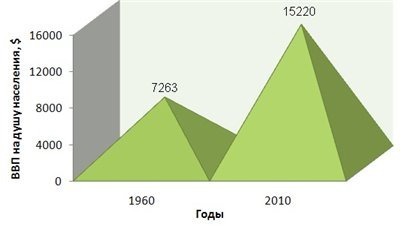 For example, the amount of produced agricultural tractors falling since 1995, and from 2006 to 2008. in Russia there was almost a doubling of tractors — from 6,500 to 12,500. This increases the use of some other agricultural equipment, and productivity increases. At the same time increasing the consumption of other products, such as cars. If you compare the level of motorization of the RSFSR and the Russian Federation, it is necessary to consider that in the RSFSR transport problem was solved primarily by the state and public transport. In the 1940-1950-s car was virtually no commercially available. Therefore, for a correct comparison analysis of the level of motorization Russian period 1945-1960 gg. made taking into account the state of cars and public transport, and in the period of 1995-2010 years. subject only to private passenger cars. According to our survey, the level of car ownership from 1945 to 1960 grew by 2.4 times, while from 1995 to 2010, almost 2.8 times. Average growth in the years 1945-1950. amounted to 6.15% per year, and in 1951-1960. — 5.35%. Against 7.49% and 6.13% in the period 1995-2000. and 2001-2010 years. respectively. 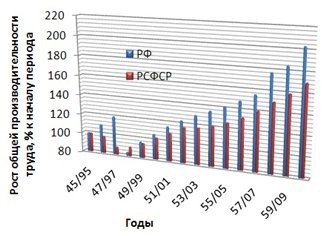 Analysis of grain crops in Russia in the periods under review gives a positive picture (Fig. 9). Well-built policy to ensure food safety is paying off. Despite the terrible drought of 2010, which did not see Russia more than a hundred years, grain harvest remains at a very high level. Labour productivity in Russia is lower than in most developed countries, but there are very high rates of growth of the indicator (Fig. 10) [9,10]. Russia ahead of the Russian Federation as the average level of labor productivity, and on the dynamics of growth of this indicator in all sectors of the economy, especially in agriculture and the service sector. At the same time Russia demonstrates a high level of productivity in the industry, both in absolute terms and in terms of growth. Modern Russia lost one of the most important factors of development — population growth. The demographic crisis is conceived very serious consequences and is the economic expression of which can be defined as the failure to obtain 95.8% of GDP growth. Russia desperately needs a demographic boom that inevitably would entail additional economic growth throughout the country. From 1991 until the mid-2000s there was a dramatic reduction in the population. However, the process was stopped, and with a decrease in mortality 2003-2004. A little earlier — in 1999 — re-start the growth process of the birth rate. Positive trends shows and migration. There is every reason to believe that in the next year or two, the number of newly Russia will grow steadily, and by 2020, the growth rate could probably be called a boom. 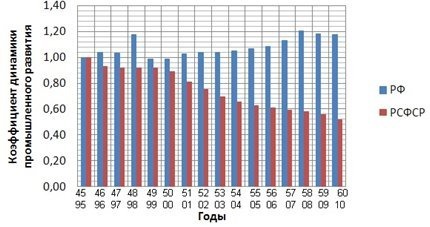 The analysis shows that for the period from 1945 to 1960. average life expectancy in Russia was 57.2 years, from 1995 to 2010. — 66.3 years . The dynamics of growth in life expectancy from 1945 to 1946 due to the end of the war. This is followed by a sharp decline due to famine of 1946-1947. By the end of 1960 life expectancy due to the rapid development of the country has achieved an average 63-67,5 years. By the end of the 2010s the figure was 66,7-68 years. Thus, characterizing the quality of life (excluding the level of comfort and accessibility of modern high-tech) over its duration, it can be concluded. Life in the modern Russian Federation in 1995-2010. better life in Soviet Russia 1945-1960 years. on average 15.9%. If we make a comparison of the most important indicators of the level of development of the country for the last year of the periods under review, you can get a clear understanding of the dynamics of development of the country and its potential. of motorization 240 for Russia will be the best option. The study shows that Russia wins the RSFSR 2.17 times on a wide range of measurement criteria. I must admit that starting the analysis, I assumed that modern Russia can boast except that a higher level of freedom, a nascent civil society and even some not so significant advantages. However, the results have been very encouraging and have strengthened the belief in the huge potential of Russia. *** The Soviet economy lay in the period of industrialization before 1940 and in the post-war period in 1945-1960. During this period the Soviet Union showed the most rapid rate of growth. And while coasting the Soviet Union continued to grow for another 20 years, reaching a peak in the 1970s, as a result the state has a system failure. USSR collapsed under the onslaught in the first place itself. One of the most important reasons was the stale economy, rooted in the period of 1945-1960 years. In the progress of the victim were brought comfort, freedom and life. The fall lasted for a long time and delayed until 1998 but Russia has begun to rise again over all difficulties. Mikhail Gorbachev lessons of the war and the victory / / "News". 1990. May 9. Soviet Casualties and Combat Losses in the Twentieth Century / Ed. by Colonel-General GF Krivosheev. London: Greenhill Books, 1997. The Federal State Statistics Service. The calculated value. According to the State Statistics Committee of the USSR — 1.6 trillion. rub., corresponding to different estimates of about 2.7-3.4 billion (in 2009 dollars). "Politics" № 47 (508) from 18.12.2006. According to the CIA Factbook — about 2.53 billion dollars (in 2009 dollars) to the collapse of the Soviet Union. 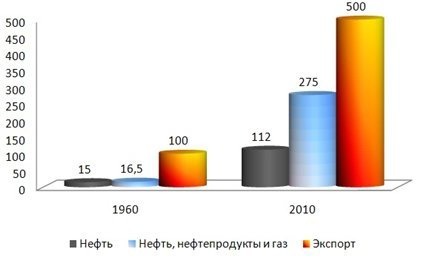 According to Boris Ikhlov (KPRF.Ru) in 1990 — 3325 billion (in 2003 dollars). Question of the GDP of the USSR remains the most controversial. According to the Federal State Statistics Service (Rosstat), CIA Factbook, IMF  The calculated value. The national economy of the USSR for 70 years. Jubilee statistical yearbook / / Moscow: "Finances and Statistics", 1987. 1. History of the Soviet Union. Edited by Ostrowski VP — Moscow, 1990. Kara-Murza S. History of the Soviet State and Law. Russia and the world. Edited by Daniel A. — M., 1994. Geoffrey Hosking. The history of the Soviet Union. 1917-1991. — M., 1994. TSB, third edition. 1969-1978. 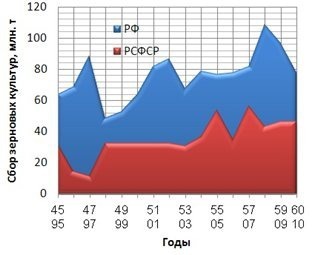 AV Poletaev GROSS DOMESTIC PRODUCT OF THE RUSSIAN FEDERATION AS COMPARED TO THE UNITED STATES OF AMERICA, 1960-2004 gg. Moscow. Higher School of Economics. 2006. According to the Federal State Statistics Service. TSB, third edition. 1969-1978 Author: Alex Shumkov, teacher Samara State Aerospace University, Ph.D.